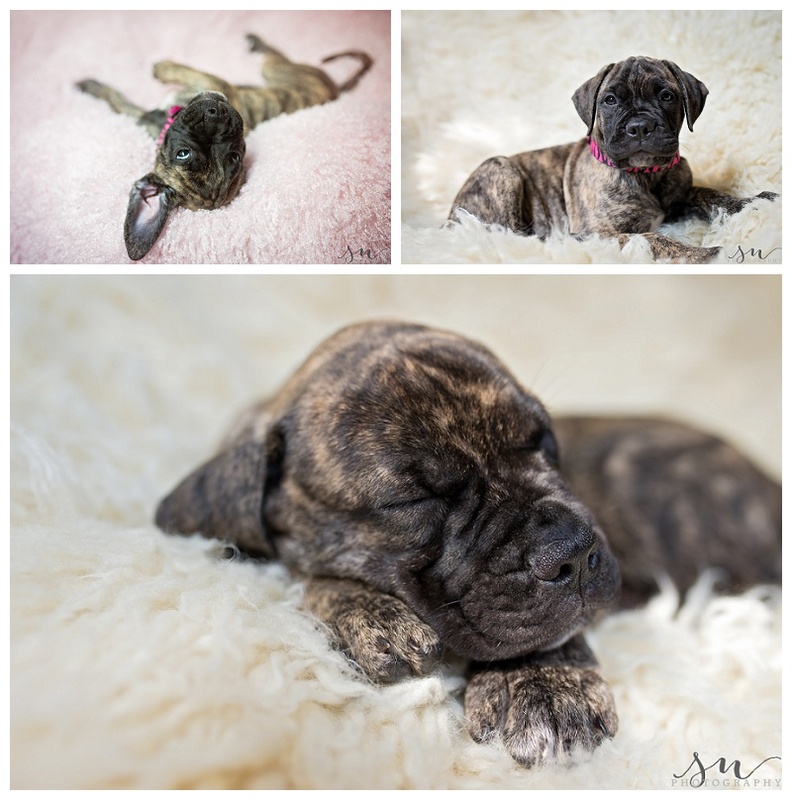 This is a little outside of my usual clientele, but my parents got a 7-week old bullmastiff puppy this past weekend that they named Zelda. She was so darn cute that I knew I had to take some photos of her, but let’s just say I might have gotten a little carried away with all of my baby props. I’ll admit, capturing her attention and coaxing her to hold still was a bit challenging (note- puppies love to attack expensive lenses and flokati rugs), and I was just about to suggest we take a break when she suddenly went from super feisty to ultra sleepy in about 10 seconds flat. She fell into such a deep sleep that I wondered if she would let me wrap her like a newborn (I have seen other photographers successfully do this, which gave me the idea). To my surprise, she never made a peep (and I think she was really cozy too). 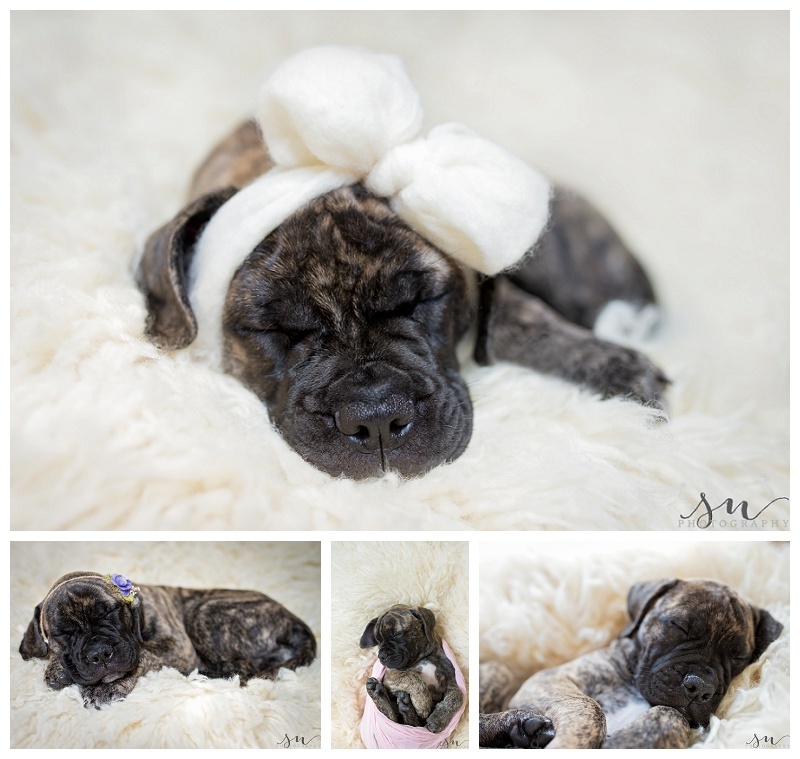 The great thing about bullmastiff puppies is that they are pretty much the size of newborn babies, with lankier limbs, so most of my props worked well. Doesn’t she look sweet? I love her pretty brindle markings. Below is a popular newborn pose right now, and Zelda rocked it! She even stuck out her little tongue for me. Sweetly dreaming in a sea of white fluff. Doesn’t she look peaceful? In the end, it was a super fun and unpredictable session (seriously, you forget that puppies only have two settings– wild and sleeping!). 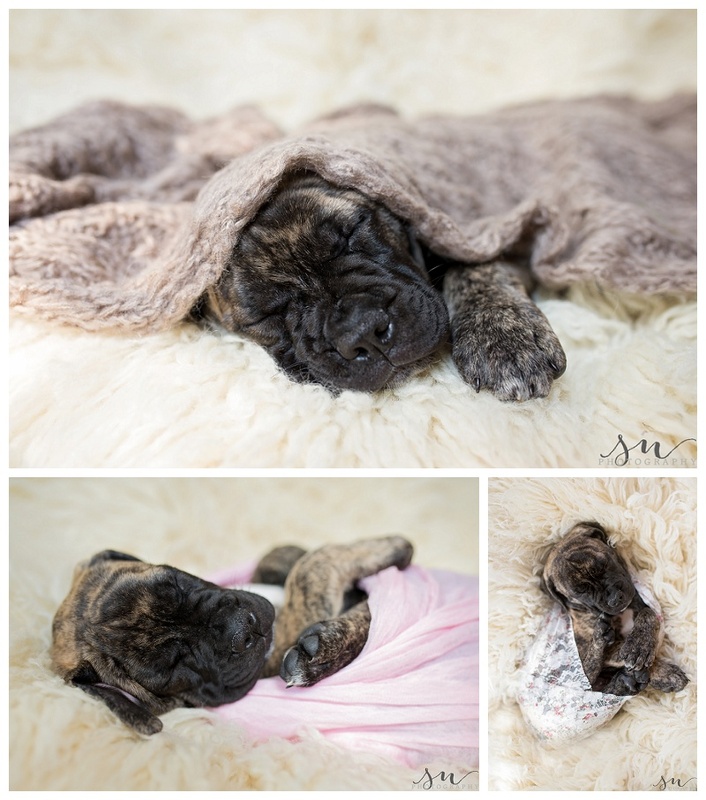 I’m glad that we managed to get some cute memories of Zelda as a young pup, even if some of the poses were just plain silly (hey, I’ll take the newborn wrapping practice where I can get it!). I joked to my mom that I’m looking forward to receiving Zelda’s birth announcement in the mail! Now that would be a first! Last month, I attended the ultra-talented Melissa J. Photography’s newborn workshop in Colorado Springs. I have always admired her work and was so grateful to grab a last-minute seat for her 2-day class. Fortunately, I didn’t have to buy an airline ticket to attend (as most of the other attendees did), and it was a quick hour-and-a-half drive to her quaint studio in downtown Colorado Springs. To make it even better, my mom decided to come along to keep me company, and even treated us to a room at the world-famous Broadmoor Hotel. We had an intensive weekend with learning and shooting a variety of maternity, newborn, sibling, and parent poses. Melissa was truly a down-to-earth person and such a fantastic teacher, and I learned many new techniques that I can’t wait to try during future newborn sessions. I also met a great group of photographers, and it was so much fun to connect with other women in my field. This little guy below was one of our babies that I personally posed with Melissa’s help. I just adored him, as he reminded me of my second born son as an infant. The “taco” pose, has always been a favorite of mine, and Melissa took me step-by-step through it so that I could achieve it on my own. While most workshops consist strictly of the instructor posing the babies and the attendees photographing them, I really appreciated the hand-on mentoring portion of this class. Melissa uses studio lighting for her newborn sessions, which is new to me. I loved the simplicity and consistency of her lighting. As an on-location natural light photographer, I never quite know what quality of light and color casts I will be confronted with at other people’s homes, and the thought of more consistency in my images is really attractive. Hopefully one day I can have a studio space and will be able to invest in a similar lighting setup. Aren’t these babies divine? I love the lighting, shadows and gorgeous colors in these images. Every time I attend a workshop, I am so grateful for all that I learned, the contacts I made, and the overall investment in my business. Thank you Melissa, for a wonderful two days! Their property is pretty magical– I kept thinking what an amazing childhood these two little boys will have and all of the adventures they will go on together without even having to leave their own backyard! And in the end, the goat stole the show! (mis) adventures of this amazing family! Last month, I had the honor of photographing the most adorable pair of newborn twins, Avery & Parker. Just 10 days old, they were each around 5 lbs of pure sweetness. My mom came along as my assistant and we had so much fun cuddling with them in between poses. They were absolutely perfect for us, and we were able to get a variety of poses and backdrops. The little girl had such tiny features, and the little boy gave us quite a few smiles! It was so much fun to spend the morning with them. Congrats to this gorgeous family of four! Last week, I was lucky enough to photograph this little lady! She had unbelievably gorgeous skin and a full head of dark hair. We were able to get a few shots of her with her mama and big brother as well! Congrats to this beautiful family of four!